My wedding day was one of the most wonderful moments of my life. I am so lucky to have had my Dad there to share it with me. November 4th marked his 65th birthday and 5 year anniversary since he passed away. 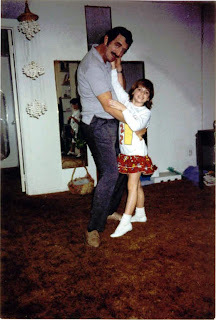 Even as an 8 year old girl, I loved to dance with my father. This picture is of me and my Dad dancing at our home in Baytown to celebrate my 8th birthday! I can remember many details from that special day, but this is the one I cherish the most. I was and always will be a Daddy's girl. I know that Emma with cherish her relationship with her father as much as I did with mine.